We are very pleased to announce the release of the new DPT Mark2 suppressor. We have been producing the modular suppressor (now called Mark1) for 5 years now and felt we had to make some improvements on its design. The new Mark2 is shorter past the muzzle by 10 mm (95 mm forward instead of 105 mm), smaller in diameter (43 mm instead of 44.2 mm), coming back a 120 mm over the barrel instead of a 100 mm for the standard over barrel suppressor and 170 mm instead of 150 mm for the magnum version. There is a slight increase on the weight by 25 grams on the standard over barrel and 15 grams on the magnum over barrel , which is on the back part of the suppressor. The new baffles are the same weight as the old ones but are extending 15 mm instead of 17 mm. So the overall balance when fitted on a rifle is almost unchanged and sound performances are identical. The new Mk2 is built stronger than the Mk1 and therefore has a rate of fire going up from 60 round/hr(Mk1) to 70rounds/hrs(Mk2) without a sleeve, and if a stainless steel baffle is used, rounds count goes from 90rounds/hrs(Mk1) to 100rounds/hrs(Mk2) with out a sleeve. 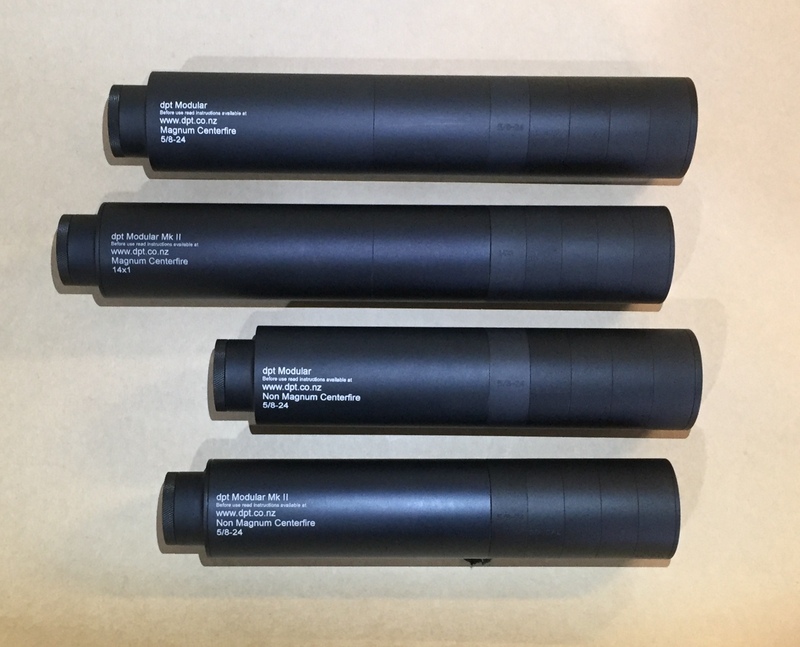 The Mark1 suppressor will be phased out later during the year but all the parts for it will still be available at the same price. Parts between the Mk1 and Mk2 are not interchangeable . Only the rear bush remains the same. The ultramag suppressors and rimfire suppressors remain the same. And pricing remains the same over the whole range. The Claw, dogmatix, Terminator and 24 others like this. Having a shorter nose is a great feature. Awesome, they look like the business as usual. Hopefully for all of us who have invested in the originals the spare parts, baffles will be available for a long time into future? Shootm, tetawa and rossi.45 like this. Cool, will be in touch for a magnum can and brake next week. Parts will be available for years to come. jakewire, Shootm, Seventenths and 7 others like this. Our suppressor MK 1 seems quieter now as we clean it regularly including the SS baffle. We grease the threads each time. Both my son and I have noticed the difference. great stuff...that should make rifles balance even better. keep up the awesome work and after sales service. Any intention of changing the muzzle forwards profile? Shortening muzzle forward length with no negative changes is a step in the right direction. Tahr and Matt2308 like this.